Children want to look as scary as possible on Halloween, but moms and dads can, and should, be concerned about letting their kids head out to trick-or-treat in masks that can make it tough to see approaching vehicles or lesser hazards like raised cracks in the sidewalk. 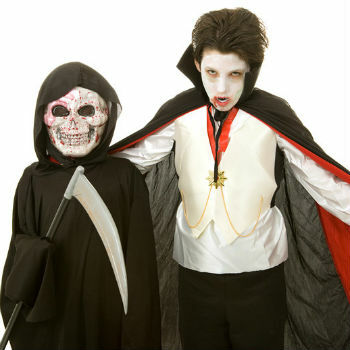 Halloween makeup is a much safer alternative, and more comfortable for your child. However, many people are laboring under the illusion that it’s difficult and costly to do your own Halloween makeup. Here is the reality. An expensive and elaborate makeup array is not necessary to change your youngster’s lovable face into a creepy animal, monster, or zombie. The majority of families most likely currently have many of the products you will require to produce a fabulous makeup kit. Right here are a couple of home-grown Halloween makeup ideas to polish the best Halloween costume. Use a damp sponge to use cake mascara or dark eye shadow to produce sideburns, mustaches, and other facial hair. Apply moderately over the entire face to darken your youngster’s skin tone. Develop a bushy mustache or streaming beard from crepe wool (also called “crepe hair”) or yarn. You can use a safe mix of flour and water to paste the ‘hair’ onto your kid’s skin. Make brand-new eyebrows for your youngster by concealing the old ones with several applications of a thick paste made from ordinary facial soap and water. Cover the paste with foundation and draw brand-new shapes any place you desire them. The end of an old nylon can produce a decent “bald” impression, or you might use an old fashioned rubber bathing cap if you can find one. You can also find a head cap at a Halloween store. Glue on some crepe wool or yarn to develop a customized wig. Mix together white chalk with cornstarch from your pantry, and dust it on your kid’s face to create her a deathly pallor. Finally a use for styrofoam peanuts! Use the ones that are little cylinders and not the ones that are twisty. Dip them in black watercolor paint and attach to your monster’s neck with a flour and water mix for a terrific neck bolt effect. Mix lipstick and green and yellow eye shadow to simulate contusions. Add a little purple for worse bruises. For a festering sore, coat the location of the injury with baking soda, then use a spray bottle to really gently spray with vinegar. The bubbling sore will remain till cleaned off if let dry. Eewww. That should be gross enough for them! When the night is over, and it’s time for your little beasts to go back to wearing their normal sweet faces, you can use baby shampoo to remove the flour paste and makeup quickly and safely.